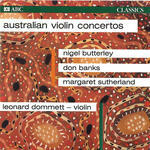 Concerto for violin and orchestra / Don Banks. Instrumentation: Solo violin, 3 flutes (1st & 2nd doubling piccolo, 3rd doubling piccolo & alto flute), 3 oboes (3rd doubling cor anglais), 3 clarinets (3rd doubling bass clarinet), 3 bassoons (3rd doubling contrabassoon), 4 horns, 3 trumpets, 3 trombones (3rd doubling bass trombone), tuba, timpani, percussion (3 players), piano, celeste, harp, strings (6.6.5.4.3). 12 Aug 68: Royal Albert Hall, London. Featuring BBC Symphony Orchestra, Wolfgang Marschner, Norman Del Mar.